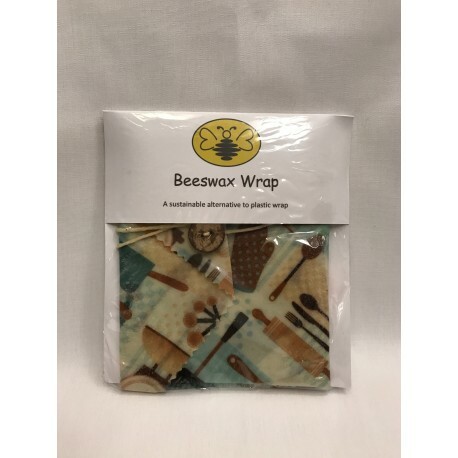 Beeswax wraps are a sustainable alternative to plastic wrap. Each wrap is made using 100% cotton and coated with organic beeswax, jojoba oil, and tree resin. The beeswax and jojoba oil have antibacterial qualities that help to keep your food fresh while allowing you to use the wrap again and again. Each wrap measures approximately 14 by 14 inches and is secured by a cotton string coated in beeswax and a button fashioned from a coconut husk. Note: Button used may be different than what is pictured. Directions: Wash with cold water and mild soap before first use. Use the warmth of your hands to mold your fabric to the desired surface. These wraps are specially designed to hold sandwiches or other like sized objects but can also be placed on top of bowls or in most other ways that saran wrap is used. Once item is wrapped, use the string to secure the package by winding around the item and wrapping the string around the button. Cleaning Instructions: Wash with cool water and mild soap and let air dry. Do not use hot water, put in the microwave, or place in contact with any other heat source. Do not use to wrap raw meat. Each wrap will last about a year when used a few times a week.